So, Yuki had some coupons from unused miles on United Airlines. Last night we used one at Ai Sushi. 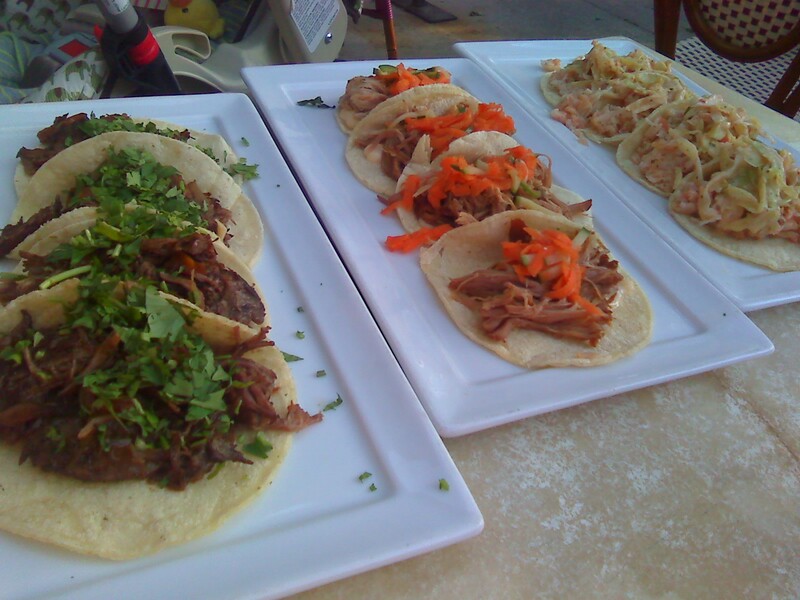 I dvr’d the Bears-Giants game and we headed down to Ontario St for some grub. Parking was a pain because all of the meters were “For Residents Only Until Oct 4”. We did find a spot about a block away so we didn’t have to spend on valet. Tonight we could have gotten a spot right in front. Oh well, can’t blame that on the restaurant. The interior is really nice. It has the open loft feel with exposed brick and wood beams. The art on the walls was not flashy at all and instead complimented the brick. Colors were soft and very intimate. It has a real nice setting inside. I did use my phone’s camera, so these pics are terrible. First thing we got was the Sunomono Moriawase. Shrimp, real crab meat, and octopus lightly cooked along with fluke sashimi in a dashi vinaigrette with daikon sticks and seaweed. It was really good, fresh fish and not to vinegary at all. Next was one of the specials of the night, Wagyu Tobanyaki. 5 slices of real Kobe beef imported from Japan, enoki mushrooms, and shimeji mushrooms that you cook yourself on a hot stone with butter. The beef was so soft and delicious. It was definitely the real thing, none of that cow from Nebraska. After that we each had a bowl of Kabocha Corn Soup. 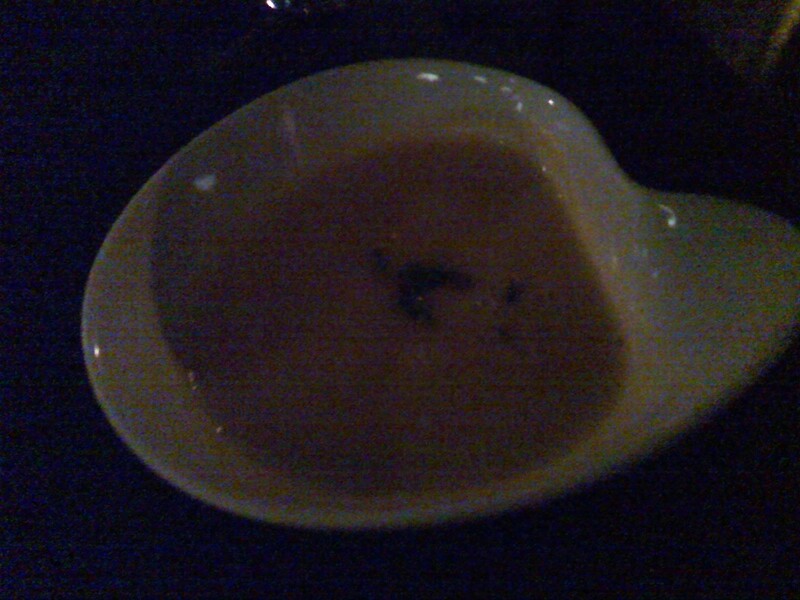 Simply a puree of kabocha and corn, probably with onion. It tasted like something I would make, which is to say it was pretty tasty. Then came the Chawanmushi. A Chinese style egg custard with shiitake, shimeji, and enoki mushrooms. The custard was the perfect consistency. Not a fancy dish, but a good one. The first maki roll we got was their Habanero Lobster. It had tempura lobster, kampyo, ginger, mango, avocado, habanero, capers, cilantro, and sour cream mayo. We’re not usually fans of rolls with more than a few ingredients, but this one was pretty good. That habanero packed a punch, but not so much that you couldn’t taste the lobster’s sweetness. It was pretty good. 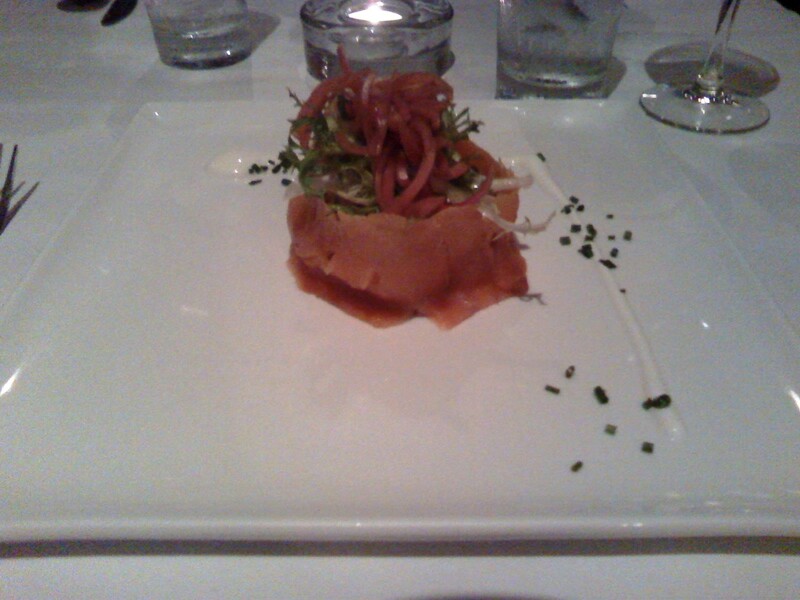 They also put a few slices of smoked duck on the plate. 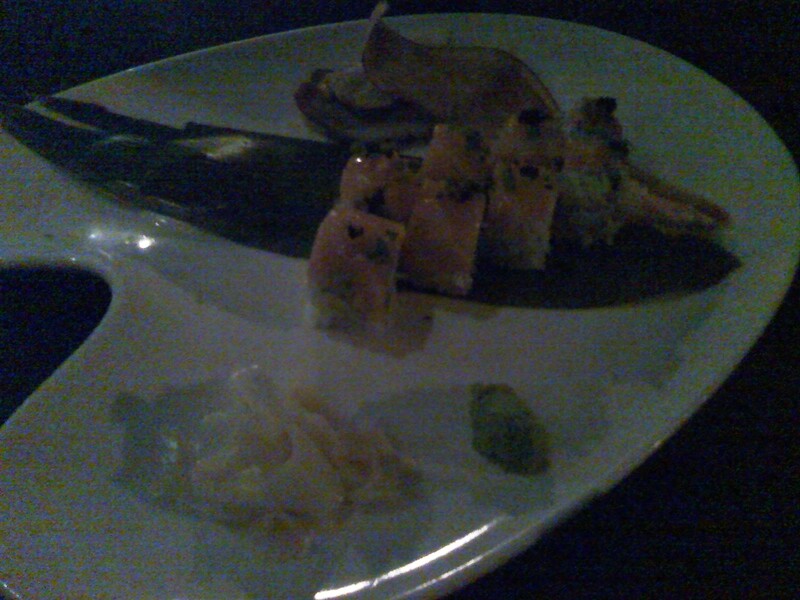 They serve smoked duck sushi and must have needed to get rid of it, but it tasted pretty good to me, so I didn’t mind. The last thing we got was one of the night’s special rolls, Orange Maki. 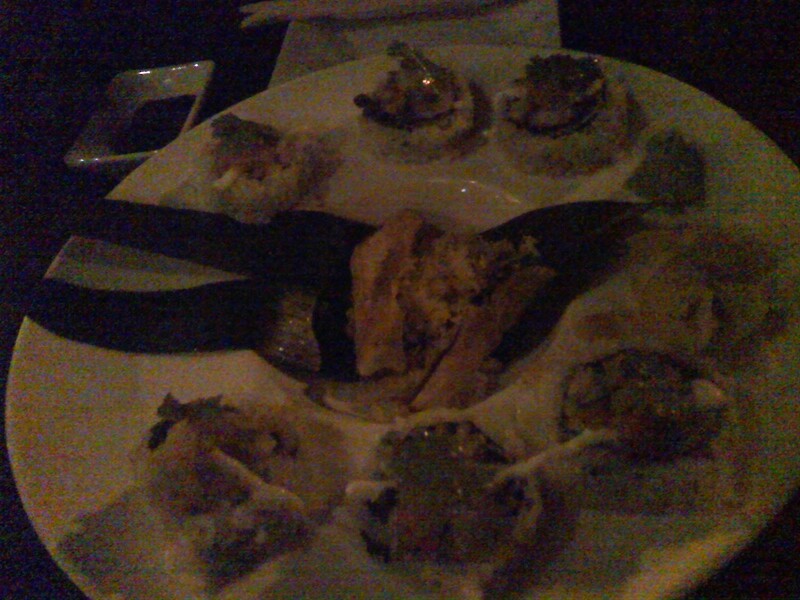 It had tempura shrimp and orange zest inside and was topped with salmon and black tobiko. It was really good! Light, sweet, and refreshing. I would definitely order that roll again. Also, there was more smoked duck on this plate. We didn’t have any room for dessert and didn’t even look at the dessert menu so I can’t comment on that. The service was professional. We never had to wait long for anything, we weren’t rushed or bothered to hurry up, and our server was very knowledgable of the menu. 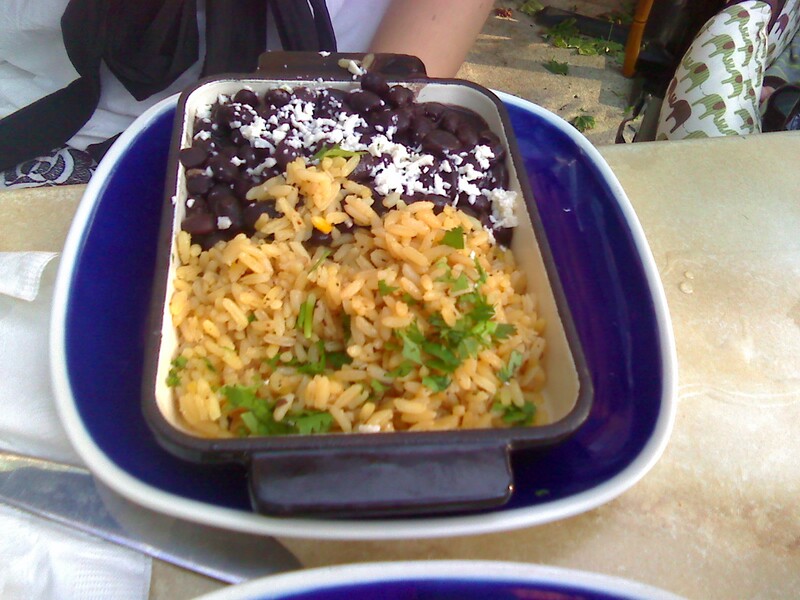 The only gripe I have, and it’s nitpicking, is that the food should have come out in a different order. The beef should have been last and soup served before the chawanmushi. Other than that, I have no complaints at all. 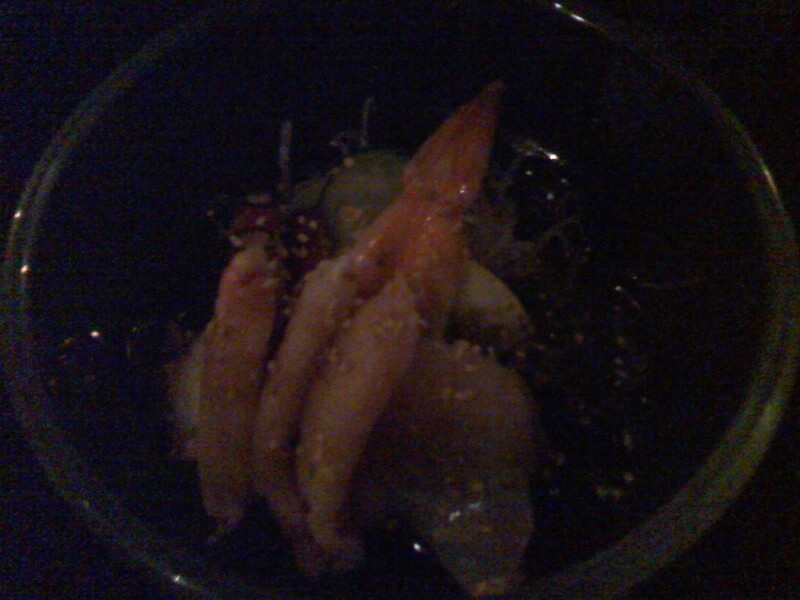 I would have to say that Ai is one of the better sushi restaurants we’ve been to in Chicago. I wouldn’t call it the best, but it is definitely worth while with some creative offerings as well as some classics, all very fresh and properly prepared. I would go back without hesitation. The first thing you’ll notice about this post is the lack of pictures. Yuki took me out last night for my 34th birthday (damn I’m gettin old!) 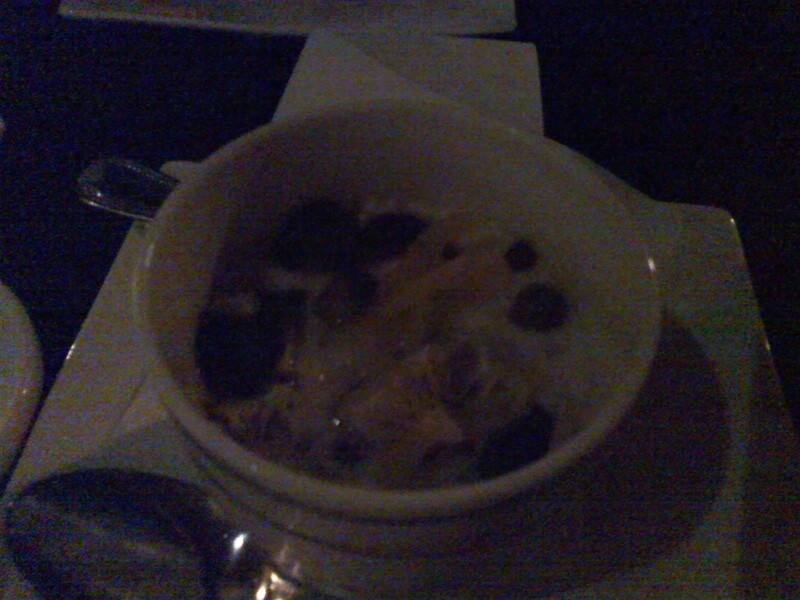 and my recent experience, I’m sure you’ll agree, has not been good using my cell phone’s camera in dim restaurant lighting. While I have no problem using my regular camera when traveling, I feel weird pulling it out here at home, like a tourist in my own city. 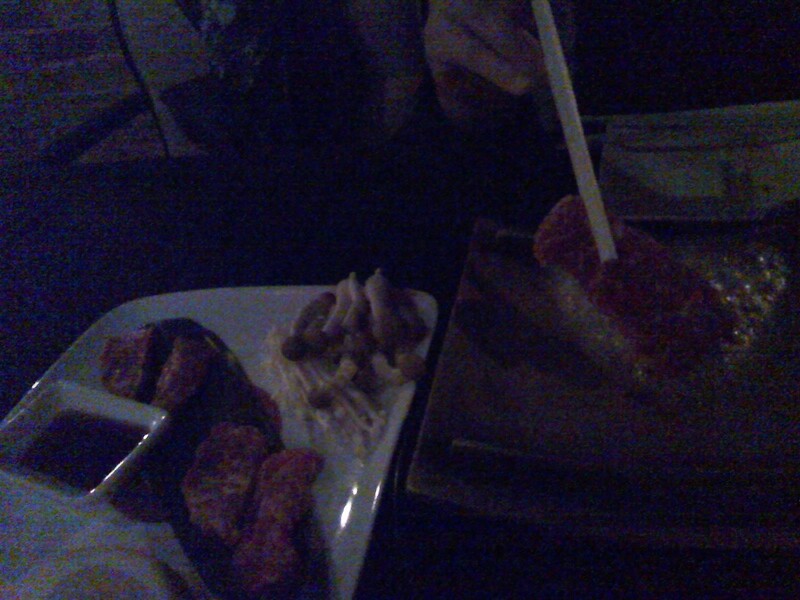 That said, here is how our night at the highly acclaimed Naha Restaurant went last night. We had a 7:30 reservation and showed up right on the dot. The hostess informed us that they were running a little behind and it’d be about 15 minutes before our table would be ready. No worries, we understand that sometimes this happens. So, we sat at these extremely uncomfortable built-in benches along the wall and waited…and waited…and waited. 15 minutes goes by and nothing. Once 8:00 rolled by I went up to inquire how much longer it’d be. I was told that 3 tables had already paid and they were just waiting for them to leave. Ok, however, the assistant hostess rolled her eyes at me for asking. Sorry, but that’s about as rude as it gets when it’s way past our reservation time and we still have not gotten our table. Fortunately for her our table was ready about 2 minutes later; I didn’t have to get the manager. We get to our table and the interior was quite nice. Very simple and elegant with windows covering all of the exterior walls. Yuki sat on the cushioned bench, so I don’t know how comfortable that was, but the wooden chair I sat in was extremely uncomfortable. There was an ill-placed wooden bar that dug into my spine causing me to hunch over the entire time. On top of that it was way too cold in that restaurant. They could have turned the air conditioner down a good 10 degrees. I noticed most of the women around us were all kind of clenching due to the temperature. I’m pretty hairy, and even I was cold, my natural fur coat wasn’t enough insulation. Here we are sitting at our cold, uncomfortable table waiting…waiting…waiting. It took more than 10 minutes for the busser to come over and offer us our choice of water. It took another 10 minutes for our server, Albert, to come over and greet us. 20 minutes before an appearance from our server! He even made a dumb comment, “Sorry, I know you’ve been sitting here for 2 or 3 minutes.” Try 20, buddy! I put in the order for some Cava and that came out alright. After sipping on the Cava for a few minutes Albert came back over once he had taken the order from the table on my left as they were seated shortly before us. He asked if we had ever been there before. When I said no he proceeded to explain just about every dish on the menu. Go to Naha’s website and read the menu, every single dish is well articulated, we don’t need a recap. Not to mention, it was already an hour past our reservation time and we were damn hungry, just take our order! Before we could get our order in he disappeared again. Dude, we’ve been sitting for over a half and hour looking at the menu, our minds were made up over 20 minutes ago! Finally, we got our orders placed. Then, we waited…and waited…and waited. We’re sitting there waiting; meanwhile, the table to my left who had ordered just 5 minutes before we did was chomping away at their appetizers. I commented to Yuki that they’ll get their entrées before we get our apps. I was right. During the wait Albert avoided us so I couldn’t even inquire. I was getting pissed! 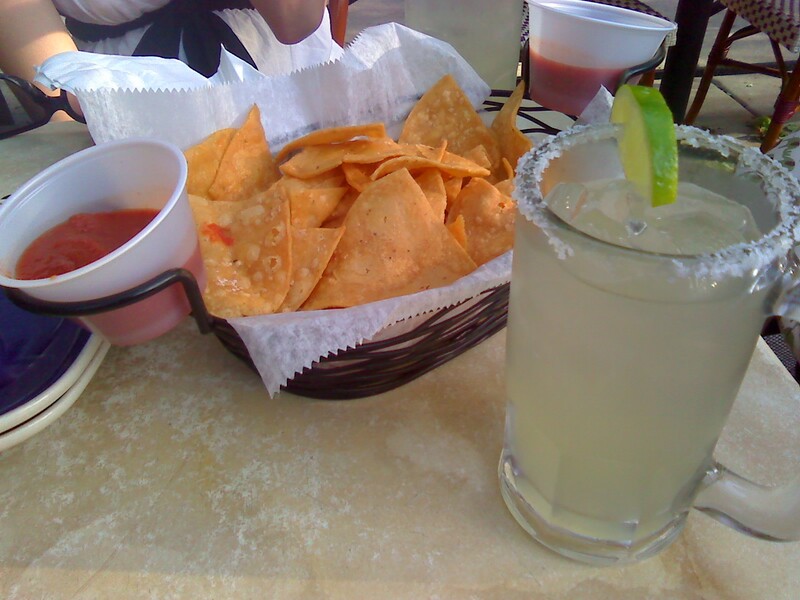 When our appetizers finally came our stomachs were rumbling. Yuki got the Risotto with Blue Crab, Oyster Mushrooms, and Lobster Bisque. The crab was pretty good, nice and moist, but the risotto and bisque were way too salty. She cleared her plate out of sheer hunger more than anything. I got the Gnocchi with Braised Oxtails, Spanish Chorizo, Rapini, Montelerriana Cheese, and Basil. 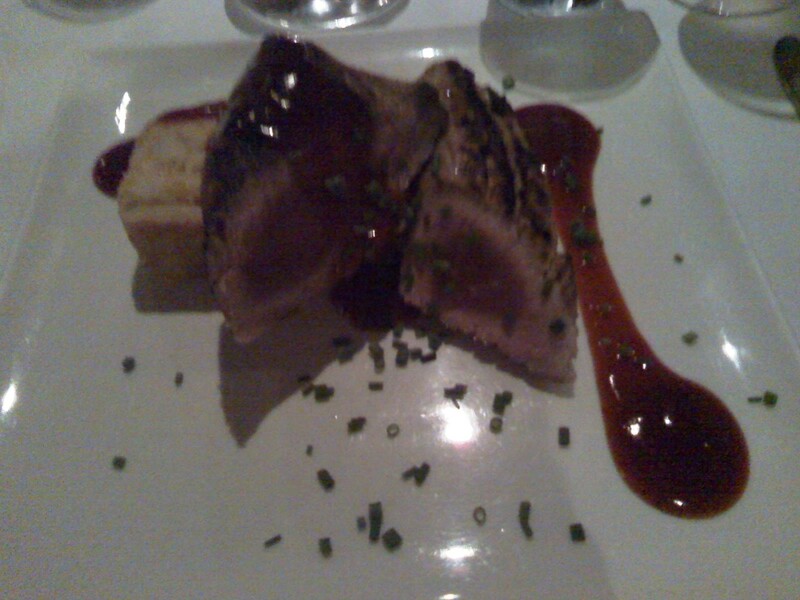 I do have to say that this was a great dish. The gnocchi were nice and soft, the chorizo added a nice compliment to the mild oxtail, the rapini a nice bitterness, the cheese the right amount of salt, and basil a refreshing note. While we were in the middle of our apps a new table was sat to my right. They ordered right away and got their apps before we finished ours. Did the hostess have a vendetta against us for asking how much longer it’d be to get our table? Then, even though we did finish our apps before them they got their entrées before us, way before us. Shoot, they almost finished their entrees before we got ours. During our wait between apps and entrées I was finally able to flag down Albert after the wait hit a half hour. He just kept apologizing and saying that kitchen is backed up. Sorry Albert, but that’s no excuse. My little quail should take no longer than 5-8 minutes to roast while Yuki’s brisket was either braised the day before or that morning. It should never take that long between coarses. I told him how I noticed that the tables on either side of us were getting their dishes in a timely fashion and his response was childish and defensive, “Sir, it’s not a competition.” Albert, man up and admit your service sucked. I was merely using the other tables as a reference point, not for some competition you may have going on in your feeble little head. We just about lost our appetite because so much time had passed. Right when I was about to tell Albert to forget it, we’re leaving, the entrées showed up, more than 45 minutes from the time they cleared our apps. Yuki had the Braised Brisket with Hen of the Woods Mushrooms and, honestly, I forget what else was on that dish. We couldn’t get past how salty the braising liquid and mushrooms were as well as how tough the brisket was. They should have called it brisket jerky. I kept watching Yuki try to saw away at that thing just to get a bite. I think it was sitting under the heat lamps for about 20 minutes back in the kitchen. At least that’s how it tasted. I got the Roasted Quail with Kurobuta Pork Belly, Duck Egg baked in La Quercia Prosciutto, and Purple Potatoes. The quail was alright, a little dry, but not terrible. The pork belly was way too sweet, and I do mean sweet. The egg and prosciutto was so damn salty! Doesn’t Chef Nahabedian know that when you cook prosciutto you’re concentrating the salt by removing the moisture? She did nothing to control the salt level. The fact that the yolk of my duck egg was solid and not runny tells me that my dish probably sat under the heat lamps for too long as well. On top of that the three main components had absolutely nothing to tie them together. I was intrigued by the combination on paper and quite honestly, it just didn’t work on all fronts. I kept imagining what Chef Tom Colicchio would say on Top Chef about editing a dish and pulling back on ingredients. Also, there was nothing on either of our plates that justified the price. Brisket is a cheap cut of beef and quail, pork belly (literally three bites worth), and duck egg don’t cost that much either. We clearly didn’t pay for execution as nothing was balanced or cooked properly. When we finished the entrées it was already 10:00 and we were ready to go home. Albert came by and asked if we were up for dessert and I told him, “We don’t want to be here for another hour, we’re ready to go.” He tried to joke around and said the dessert was on him. We really didn’t care for his nonchalant attitude. We’re two very pissed off diners, not friends. Another comment on Albert’s service, not once did he come over to see how our food was. He ignored us during our apps and he ignored us during our entrées. He left to get us the bill and the manager, Terry, came by to apologize. I told him my exact thoughts. If the service had run at regular restaurant speed we wouldn’t have waited the initial half hour to get our table not to mention the snails pace of everything else. It should never take more than a half hour to get apps, and it should never take more than 45 minutes to get an entrée from the time apps are cleared. He also blamed it on the kitchen which is a terrible cop-out. Whether deliberate or shear incompetence, our entrées clearly seemed to have been sitting in the kitchen under heat lamps for a long period of time. When Albert brought the check he also brought a dessert, Vanilla Ice Cream Parfait with Drunken Fruit and Brioche Pain Perdu, with the obligatory “Happy Birthday” written in chocolate. It was comped, but we clearly told him we did not want dessert and just wanted to leave. The correct move would have been to just take care of some of our wine and not force us to stay there any longer. A free dessert was not enough to get the usual 20% tip we tend to leave. I do have to say that Yuki had her doubts about Naha months ago when I mentioned that this is where I wanted to go for my birthday dinner. She thought the menu looked pretentious and unappetizing. Once again, she was right. I should have known better. Most chefs worth their grain of salt, especially those who claim to be farm-to-table chefs, are trending towards simplicity, fewer ingredients to showcase the quality of the food. Chef Nahabedian is stuck in the trends of a decade ago. Besides that, the service was clearly lacking. If you want to go out for a nice dinner with fantastic food, trust me, there are hundreds of better options than Naha where you’ll be paying their rent instead of buying a good dinner experience. Thanks for a horrible birthday Naha! Friday night we went out to Sun Wah B.B.Q. with a bunch of Yuki’s co-workers. We had a big group of 12 adults (I still have trouble thinking of myself as an adult) including spouses and then there were 3 babies. For Chinese food, I think it’s best to go with a big crowd so you can order a variety of food. The first thing I noticed about Sun Wah was that they had duck hanging in the window. You don’t see that often in Chicago which is a shame. Any restaurant that serves Peking Duck (Sun Wah is considered the best Peking Duck in Chicago, from what I’ve eaten here, I would have to agree) needs to display it in the window to dry the skin and show the customers what’s in store. 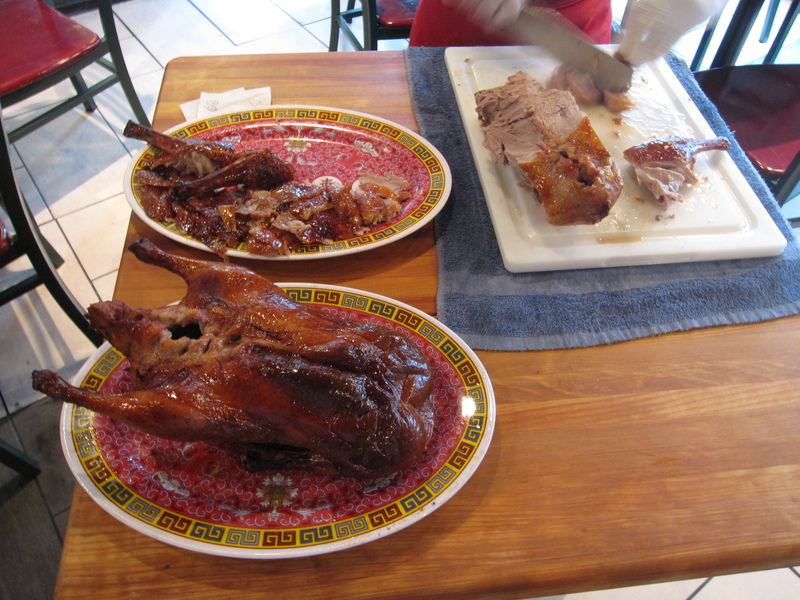 …the first thing that rolled out was the Peking Duck. Since we had two big round tables we ordered two of each dish so that we didn’t have to pass things from one table to the other. Classic tableside duck carving. Slice off that crispy skin first and then chop up the meat. Really good duck. 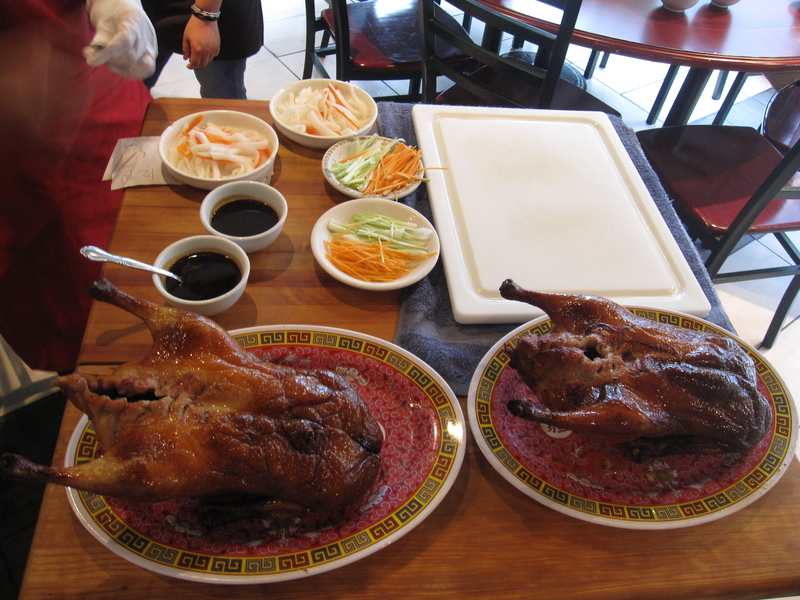 If you’re a fan of Peking Duck, and the only people I know who aren’t are veggies, you have to try Sun Wah’s. I wouldn’t say it’s really anything special, but it is the best in town, very good duck. Lobster with ginger and scallions, what more do you need? My only gripe with this dish, and it’s not unique to Sun Wah, is that the lobster was all hacked up and very hard to get the meat from the shell. 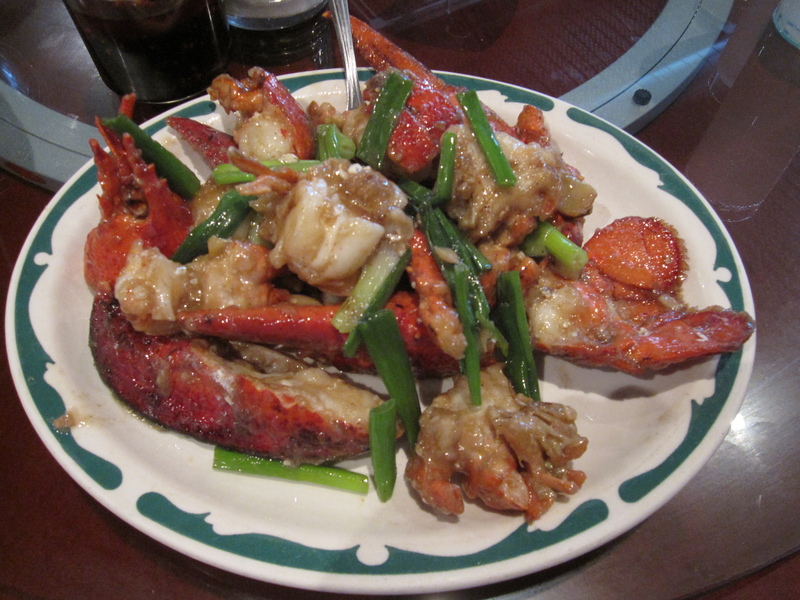 Why do Chinese restaurants hack up lobster like this? Surely there has to be a better way to stir-fry all of that flavor into the meat and keep it easy to eat. Peking Pork Ribs. Thin slices of rib meat cooked in a thickened sweet sauce. There were slices of carrot, green pepper, and yellow pepper in it as well. If you like sweet Chinese ribs, this is the dish for you! 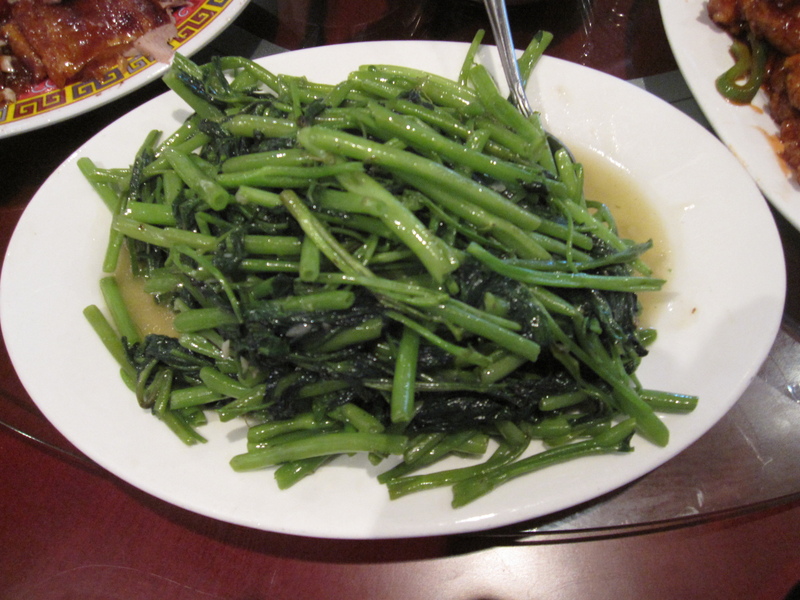 Stir-fried water spinach. We wanted green beans, but they didn’t have any. No worries, water spinach has a nice subtle bitterness to it. It’s also extremely healthy. A good vegetable to help cut through all of the animal fat we were mauling down. 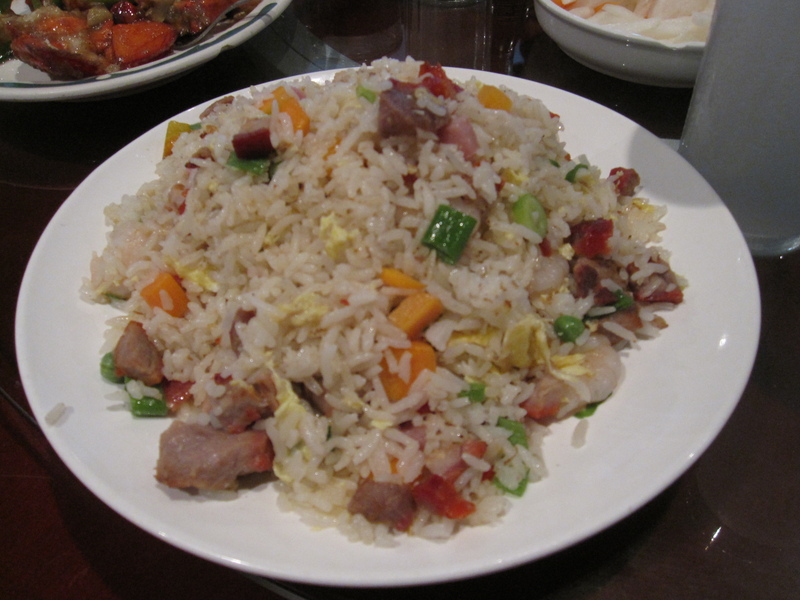 Fried rice with BBQ pork, shrimp, scallions, carrots, and scrambled eggs. 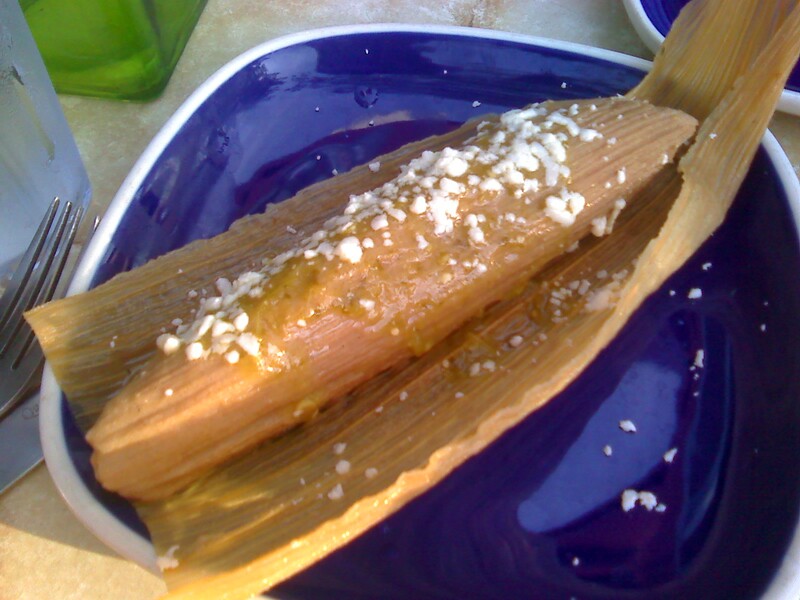 Another classic, but one you must have with a Chinese feast. Shanton soup with chunks of pork. 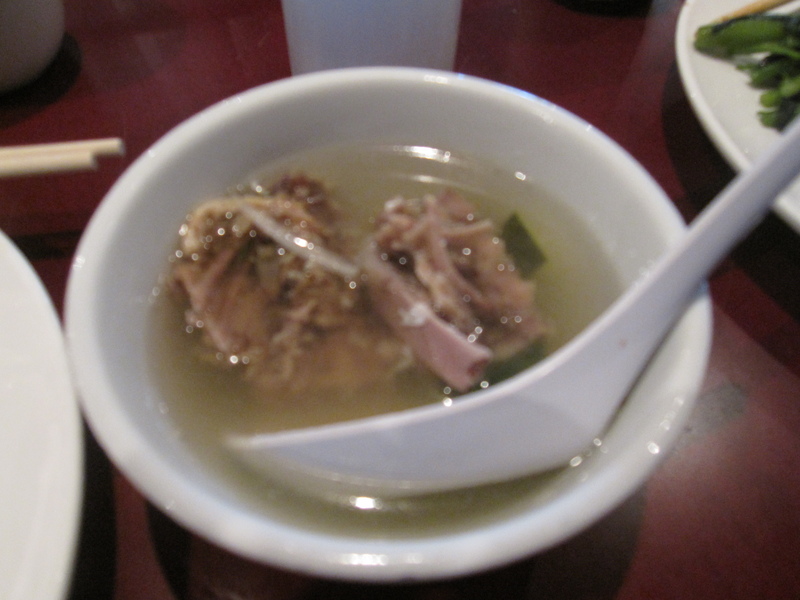 It’s the pork bone that gives this soup its flavor. This is to the Chinese kitchen what chicken soup is to the Jewish kitchen. Fried noodles. 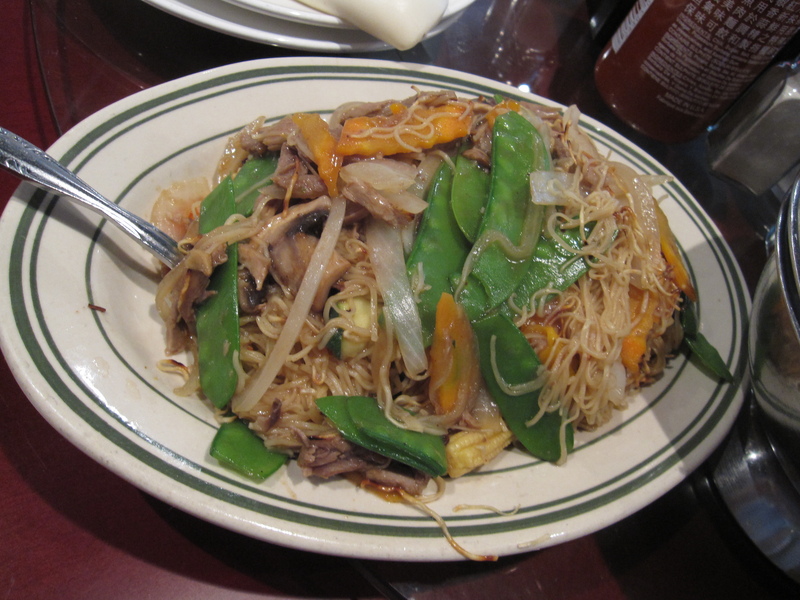 For this dish they used the duck breast from the Peking duck (for Peking you only eat the skin and some of the dark meat), pea pods, baby corn, carrots, mushrooms, and onions. Personally, I would have used shiitake instead of white button mushrooms, but hey, it’s not my restaurant. Still a tasty dish. 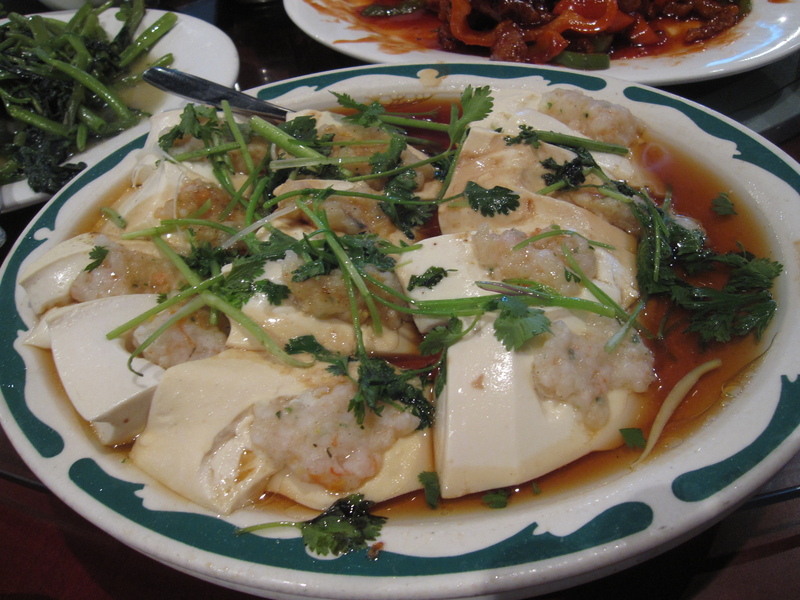 Our last dish was silken tofu steamed with shrimp. It was topped with cilantro and swimming in a soy and broth soup. It was really good. 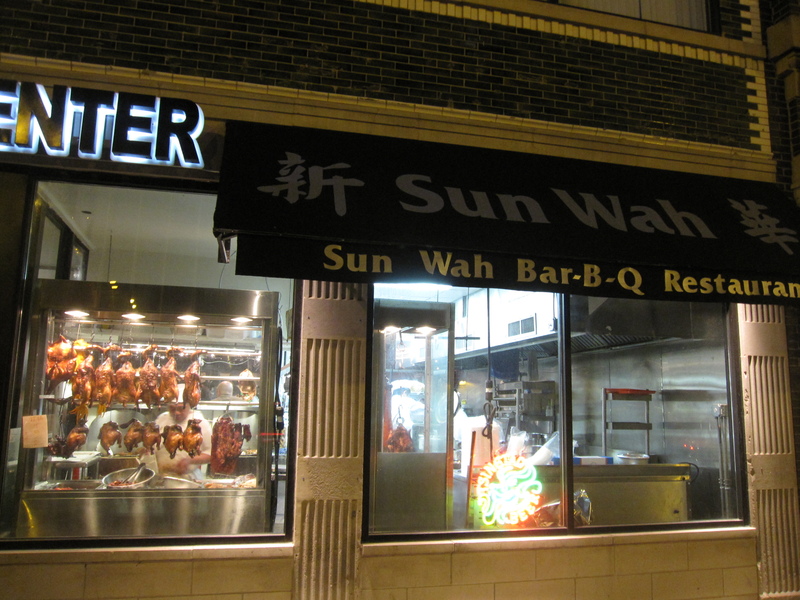 Overall, I have to say, Sun Wah B.B.Q. 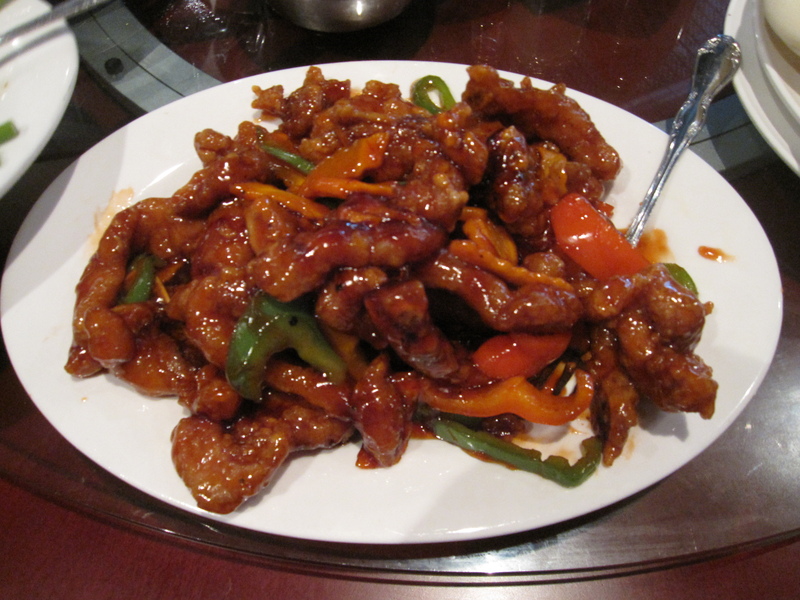 is quite possibly the best Chinese food in Chicago. While I am a true believer that Chicago does not have the best Chinese food in the world, this place is definitely worth passing through your entrails. Every dish was fresh and well prepared. Nothing was over the top, but everything was extremely solid. The best part was that all of that food, along with Tsing Dao and tip, only came to $25 per person. Well worth the weakened US Dollar. Monkfish, quite possibly natures ugliest creation (not including Ann Coulter’s morality). However, I’m a firm believer that the uglier the animal, the better it tastes. Monkfish is truly one of the best tasting fish in the sea. Called the poor man’s lobster because of a similar stringy texture it is a much more affordable way to go than lobster. Hence, the name. One thing to keep in mind with monkfish, the tail is covered in a membrane that needs to be removed prior to cooking and eating. It’s easy to do, all you need is a sharp knife. However, let the fishmonger do it for you so your garbage doesn’t stink like rotten fish the next day. The first thing I did was make the sauce. I took two red bell peppers and grilled them (I guess it’s technically not a roasted red pepper sauce) until the skin was nice and charred. I kept turning them around to make sure the entire pepper got charred. 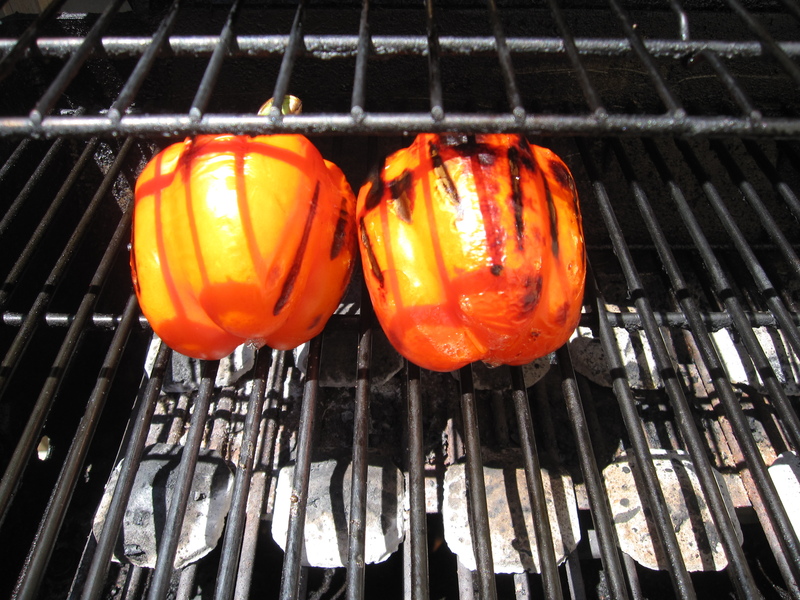 You can do this under a broiler or on the gas stove top if you don’t have a grill. The grill does add a nice smokey element to the peppers though that you don’t get on a range. 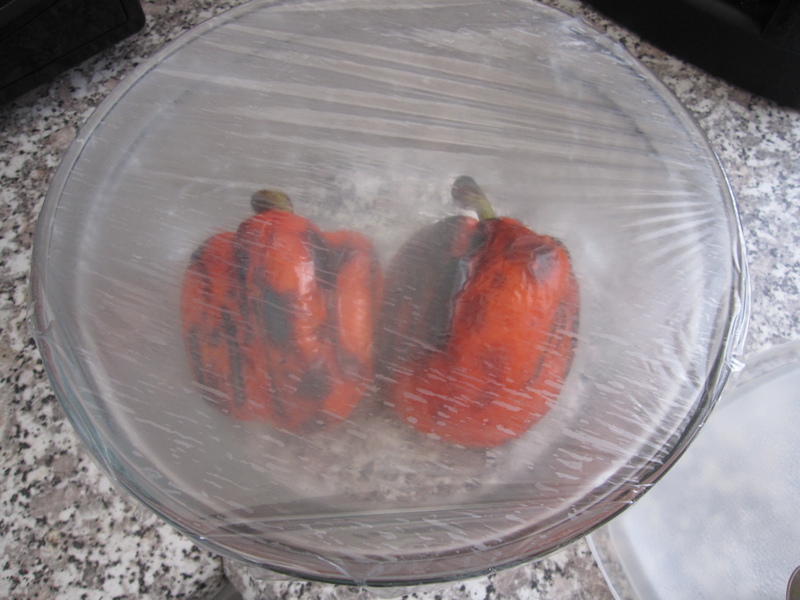 Once the skin was good to go I put them in a bowl and covered them in plastic wrap. I let them cool down in their own steam for about a half an hour. This not only allows the peppers to cool down for easier handling, but it helps the skin separate from the flesh. Then, keeping the peppers over the bowl, I rubbed off the skin and discarded it along with the stem. I opened them up and removed the seeds as well. I kept them over the bowl to catch the flavorful juices. Once the flesh was clear of seeds I put them in my small blender and pureed them along with the juice from the bowl. In a small saucepan I melted 1/2 tablespoon of butter over high heat and poured in about 1/3 cup of white wine. I let that boil until it reduced by half, approx 7 or 8 minutes. Then I poured in about 2/3 cup of cream. 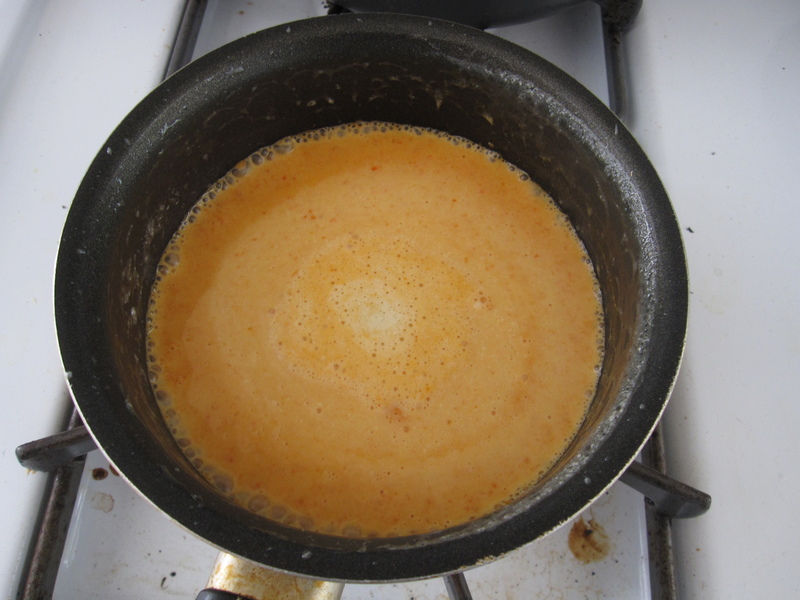 Once that started to boil I turned the heat down to med-low to keep the cream from boiling over. I let that reduce by half as well, another 10 minutes or so once it started to boil. After it reduced I poured in the red pepper puree and let that come to a boil. Again, I let it reduce by about half, another 10 minutes. Then I turned off the heat, covered the pan, and let it sit until service. 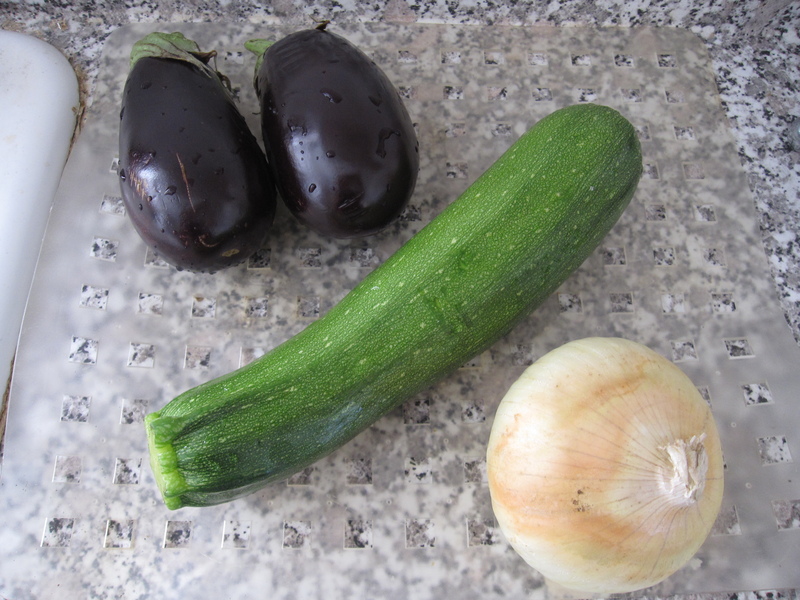 Thinking about vegetables that go well with red peppers I decided to use a zucchini, two baby eggplants, and an onion. I also cut some rosemary from my backyard and cut up a couple of garlic cloves. 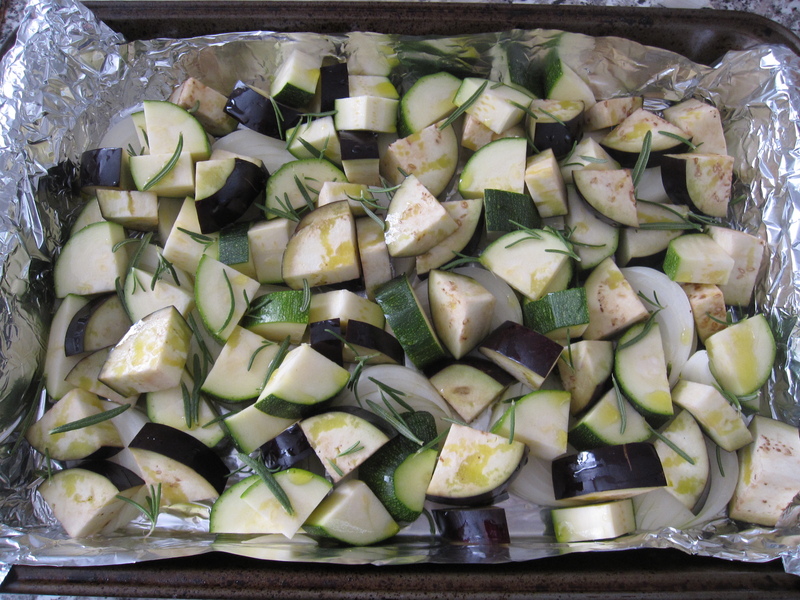 I chopped up the vegetables and tossed them with olive oil and the rosemary in a roasting pan. In a 400 degree oven I let them cook for about 20 minutes. Then, I took them out and added the garlic. I didn’t want to garlic to burn which is why I didn’t include it to start with. I also seasoned with salt and pepper at this point and put everything back into the oven for another 10 minutes. Then, I took it out again. I had cut the monkfish into 4 portions. I seasoned it with salt, pepper, and some paprika. 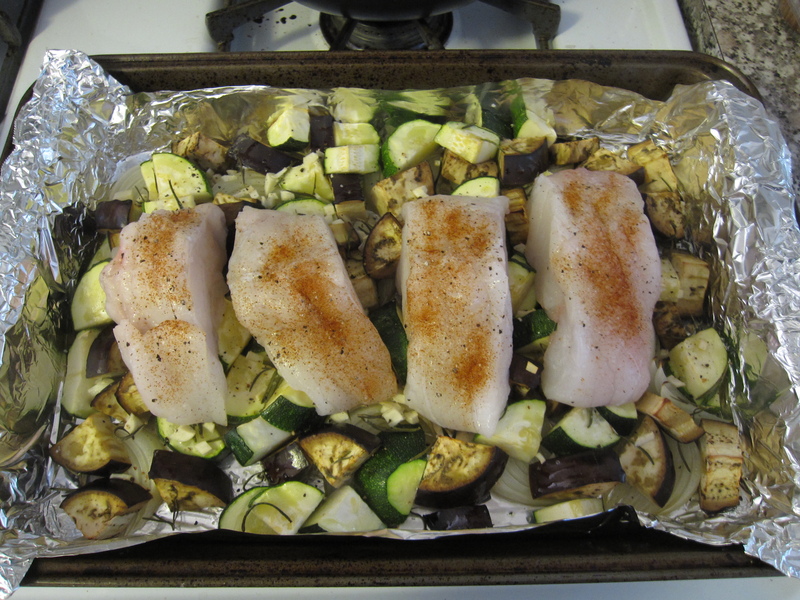 The seasoned fish was laid on top of the veggies and then everything went back into the oven for another 15 minutes. To serve, I put some white rice on the plate, scooped some of the veggies next to the rice, and laid a piece of fish on top of the veggies. 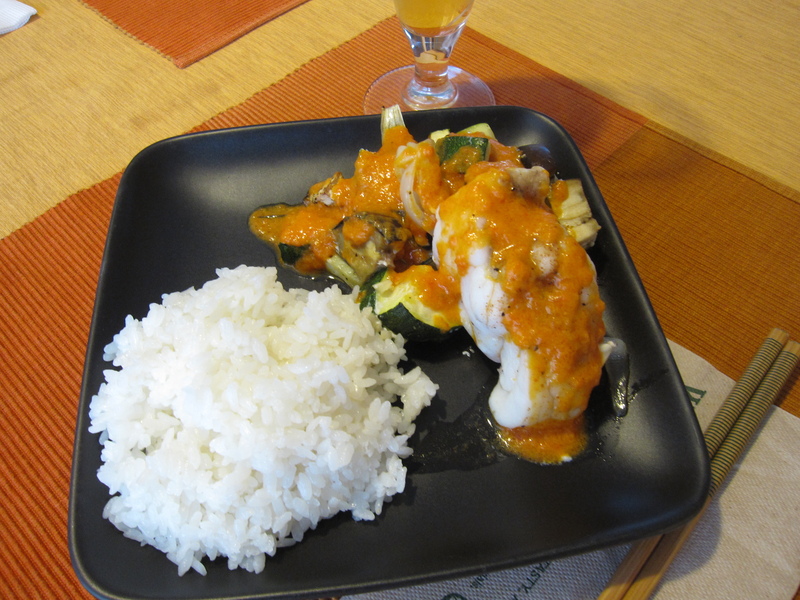 I had re-heated the red pepper sauce and spooned it all over the fish and veggies. Delicious! For our 3rd anniversary last night Yuki and I decided to try out Sweets & Savories as we’ve heard great things about that restaurant. They offer a 3 course pre fix off the regular menu for only $29 every night. That deal seemed very appetizing to us. Being BYOB was also nice so we could save on a really nice bottle. We brought a bottle of Talbott Chardonnay 2007. When we walked in the first thing we both noticed was a weird smell. It didn’t really smell like food. I’m not sure at all what it did smell like, but it was certainly a little weird. It didn’t bother us during dinner though, just when we first walked in. The interior was very drab and empty. The walls were a dark bronze-brown and there were only three pictures hanging on the back wall. Nothing else. I can’t call it minimalist because it isn’t. I think it’s more half-assed to be honest. Service was a little off from the beginning as well. They had 3 servers and no one else. No bussers or host to help them out. The first server to greet us saw our reservation but said that we didn’t have a table assigned. I thought that was a little odd, especially since there were empty tables. He got a different server over who brought us to a table towards the back. The first thing I noticed about the table was that there were salt and pepper shakers that looked like they came from a greasy diner. Not to sound like a snob or anything, but if you advertise your restaurant as serving upscale food there shouldn’t be salt and pepper on the table. The chef should season things for you while the servers should offer fresh cracked black pepper. I also noticed that their wine glasses are from IKEA. I know it’s BYOB, but that touch kind of cheapened the ambiance. It took over 10 minutes for someone to bring us a wine opener and ice bucket. A few times I noticed a server standing around looking for something to do. How about letting us enjoy a glass of wine? 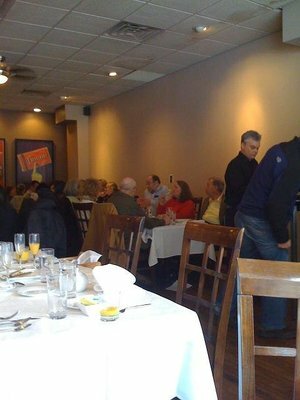 After we did place our order the service was much smoother, but still far from being good. On to the food. I started off with the Vychissoise. As simple as soup gets, yet executed perfectly! I could taste every ingredient used from the potato to the leek to the garlic. 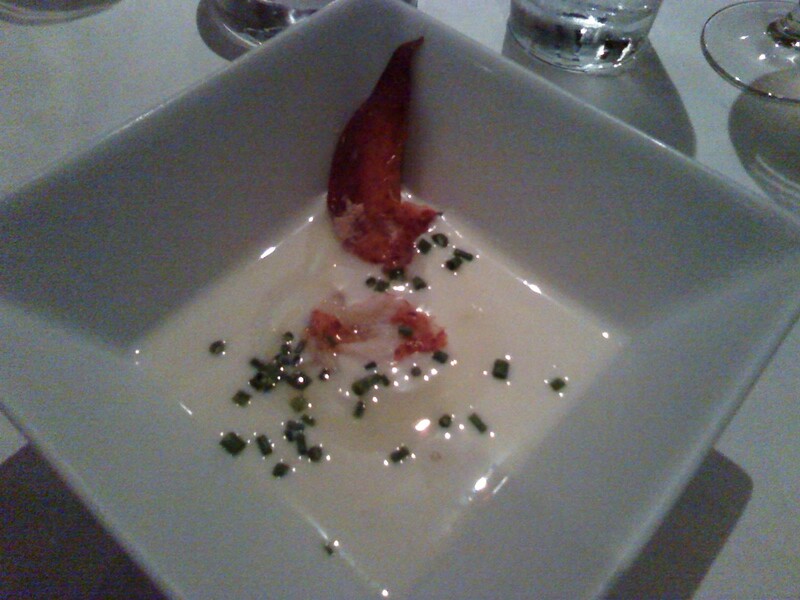 Topped with some juicy lobster claw, a drizzle of truffle oil, and some chives this was a great starter. Yuki ordered the Smoked Salmon Salade. It was also delicious. Just the right amount of vinegar to tie it all together. For entrees I got the Grilled Pork Tenderloin. I couldn’t smell any of the rosemary that was supposedly used, but I could definitely smell the grill in my meat. Cooked rare with some pomegranate BBQ sauce it was really good. I know most people prefer their pork cooked through, but a nice tenderloin doesn’t need to be. It did send me to the porcelain god (for the record it was not to throw up) three times this morning, but it was worth it for that soft meaty texture. The corn pudding was way under seasoned, but fortunately there was a salt shaker on the table. 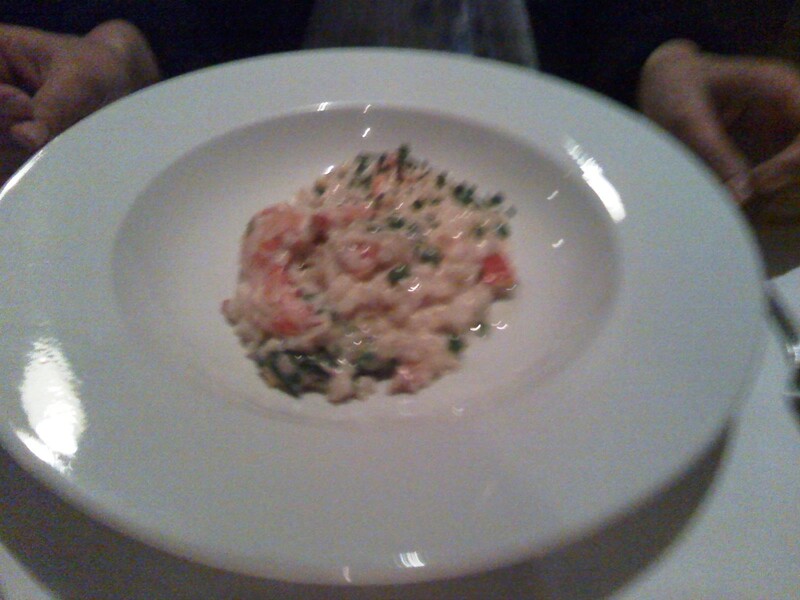 Yuki got the Lobster Risotto. With peas, arugula, and grana cheese, this was a fantastic risotto. There was a ton of freshly poached lobster in this dish. As great as the lobster was, it was the arugula that held everything together. The bitterness was perfectly matched with the sweetness of the of lobster. Fantastic! As great as the starters and entrees were the desserts fell a little short. I had the Fallen Chocolate Souffle Cake and Yuki got the Sweets & Savories Bread Pudding. 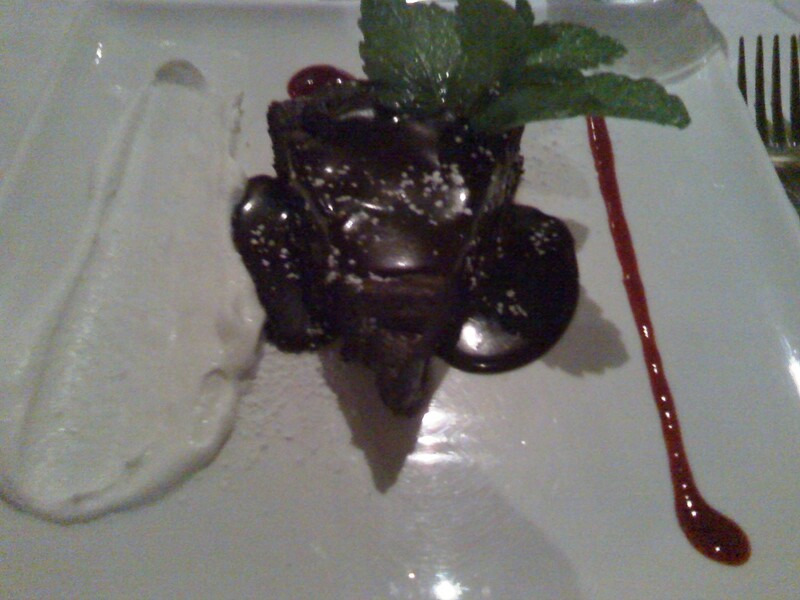 The chocolate cake was light and fluffy, but extremely rich. With just the one little line of raspberry coulis it was difficult to eat, it needed more to help keep my palette fresh. 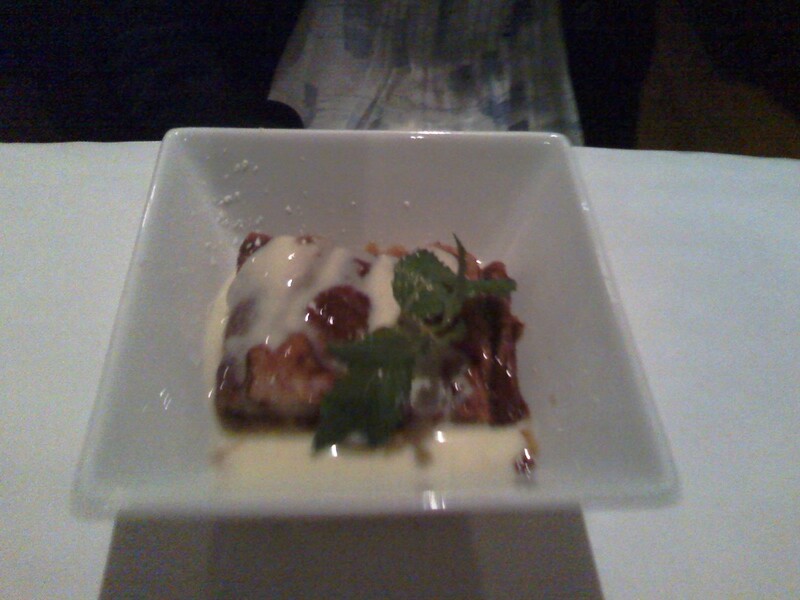 For the bread pudding it was the caramel and creme anglaise that weren’t up to par. The caramel wasn’t quite sweet enough and the creme anglaise was a little too thin, it needed to be a little thicker for some textural difference in the dish. Overall, it’s hard to argue with how good most of the food was for that price. 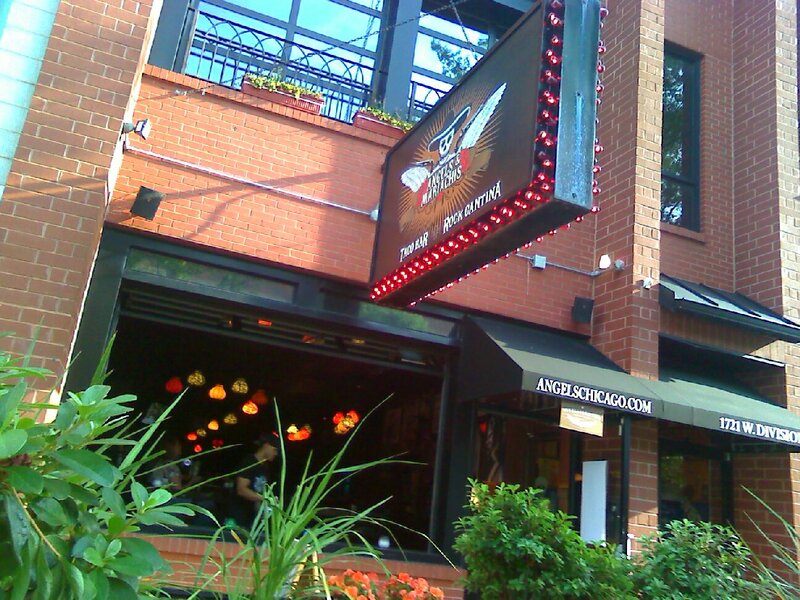 The atmosphere and service leave little to be desired, but the food more than made up for the experience. The only though is that they’ve got the savouries part down, but they definitely need help with the sweets.